We got bike lanes on Bloor. Now let's extend them westward to High Park! 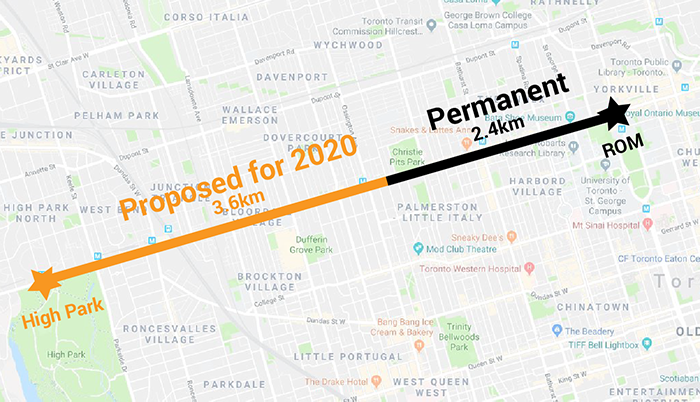 A year's worth of bike counts from Bloor St. W. at Markham St. proved that there's incredible demand to keep building out this important east-west corridor. Getting permanent, protected bike lanes on Bloor St. W. between Shaw St. and Avenue Rd. was a major advocacy win, following decades of work and countless studies and consultations demonstrating demand and widespread support. Now, our priority is to get the Mayor and City Council to commit to extending the bike lanes west, from Shaw St. to High Park Ave., by 2020. We're pushing for a 6km bikeway on Bloor St. from Avenue Rd. to High Park Ave. The more members we have, the stronger our voice is at City Hall! Join or renew your membership to help support impactful campaigns like Bloor Loves Bikes! Already a member? Consider making a donation to this campaign to bolster our advocacy efforts - your generosity allows us to spread the word even further and advocate for safer streets for everyone. Sign up for Action Alerts to find out how you can support the campaign. Most patrons of the Bloor Annex don't drive to shop. 90% of patrons in the Bloor Annex arrive by walking, cycling or transit. Separated lanes give everyone their space. The Bloor bike lanes improved safety and reduced risk for all road users. Before/after conflict analysis showed a 44% decrease in conflicts between all road users - and all road users report feeling safer on Bloor. Customers arriving by bicycle spend more. Portland State University researchers found that customers who arrive by bike spend 24% more per month than those who arrive by car. After the construction of a protected bike lane on 9th Avenue in New York City, local businesses saw a 49% increase in retail sales. If you build it, they will come. Study after study demonstrates that after protected bike lanes are installed on main streets, cycling volumes increase significantly. The Bloor bike lanes have become the second highest bike facility by volume in the city. The number of motor vehicles using Bloor remains practically unchanged. Before the lanes were installed, Bloor was a parking lot. More than 80% of the time, Bloor Street had two lanes of parking and two lanes of car traffic. Installing bike lanes retained those two lanes of car traffic and one lane of parking. This gives Torontonians more transportation options and gets the city moving.